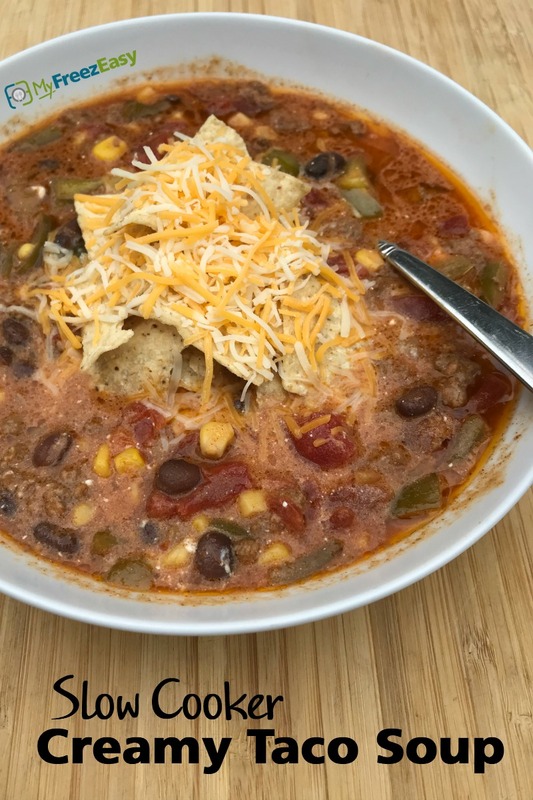 My kids love taco soup and I love how easy it is to make. All I have to do is add all the ingredients, except for the toppings and sour cream, to the slow cooker before I leave for the day. Then I come home to a delicious dinner. Just swirl in the sour cream just before serving and add the garnishes on top! Enjoy! Brown the ground beef with the minced onion and garlic powder. Drain. Open, drain and rinse the black beans. Open and drain the can of corn. To a 6 qt or larger slow cooker, add the browned ground beef, chopped bell pepper, drained and rinsed black beans, drained corn, 2 cans of diced tomatoes, and beef broth. Stir in the taco seasoning. Set on low and cook for 8 hours. Just before serving, swirl in the sour cream into the soup. Ladle soup into bowls. Top with crushed tortilla chips and cheese. 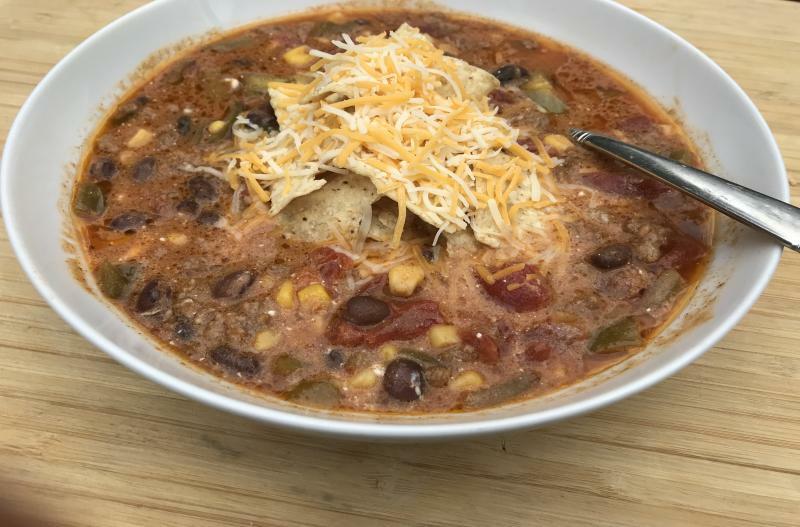 Serve Slow Cooker Creamy Taco Soup with veggies. Open, drain and rinse 2 cans of black beans. Open and drain 2 cans of corn. Open 4 cans of diced tomatoes. Place baggie in the freezer and freeze up to 6 months in fridge freezer or 12 months in a deep freezer. Thaw in the fridge overnight, or a warm bowl of water for about 20 minutes, before transferring to the slow cooker, adding 2 cups of beef broth and taco seasoning and cooking on low for 8 hours. Swirl in the sour cream at the end of cooking cycle and just before serving. Substitute Greek yogurt for sour cream, if preferred. Omit sour cream addition and cheese garnish for dairy-free meal. Thaw and add contents of baggie with 2 cups of beef broth and taco seasoning packets to slow cooker. Set on low and cook for 8 hours. Swirl in sour cream at end of cooking cycle. Serve crushed tortilla chip and shredded cheese garnish, with veggies.